I'd like to share with you three freebies I got last week. First of all: mushrooms from the forest I got from my aunt. Second: chili from the garden of my parents' neighbours. And third: pumpkin seeds from the pumpkin ;). Everything was for free! I'd like to say a big THANK YOU to my aunt for the mushrooms and to Mrs. M. for the chili. That was really sweet of you. I still did not find a place for the chili in my kitchen so I hang it on the nail of the calendar. 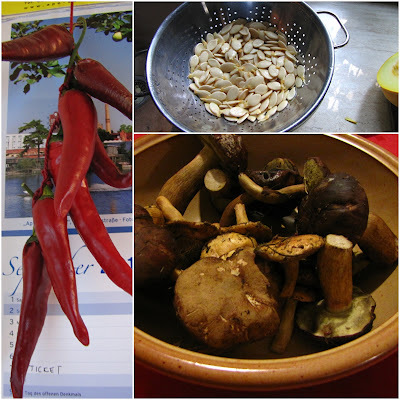 But I am sure it won't take long and I'll cook some very delicious dishes using the mushrooms and the chili. I already have an idea for the last - a lentil chili.